This little piggy went to ... surf school? Kama is small, but he sure causes a big scene when he hits the waves. His owner Kai Holt first discovered the piglet's water skills when he fell in the pool and surprisingly started to swim. 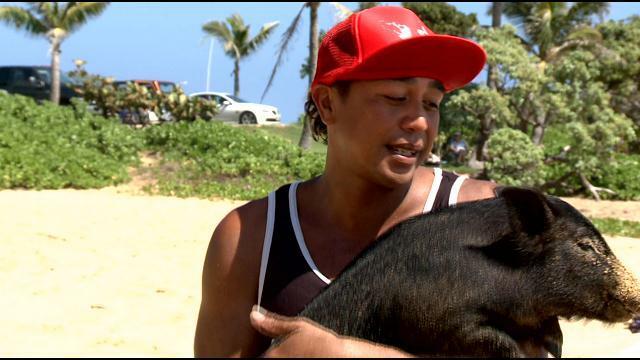 Now, the little pig wonder is making a big splash at Hawaii's Sandy Beach. He's catching waves on a surfboard and turning heads. "He really gets off on it - seems like he has a good time out there. I think it makes him happy," Holt laughed. Kama's unexpected love of the water certainly makes everyone around him happy. 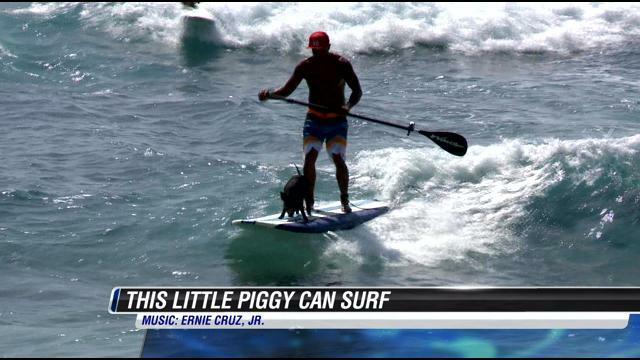 'Definitely the first time I've seen a pig on a board,' a beachgoer said with a smile. 'Sufing is Hawaii's gift to the world. It's like true happiness, you know? That's what this guy does: everywhere he goes he just makes people smile and laugh ... he brings joy to the world." Kama's skills have attracted so much attention he's even gotten corporate sponsors. Costco supplies free boards, and he gets a GoPro camera from the Bike Factory. 'As long as he lives, he's not going to see the dinner plate, that's for sure.' Holt said. Kama's on a vegetarian diet so that he stays healthy and doesn't get too big for a surf board.